Normally 2-3 working days from order. ThIS 490mm x 490mm, 7mm thick, smooth texture tile is ideal for garage and workshop flooring applications at a lower price point. Good appearance, durability and stability. When calculating the garage area, round up each dimension to the nearest 0.5 metres to allow for trimming loss. Price is per tile including delivery to the UK mainland. Do I have to prepare the floor in any way? The tiles cover a wide range of floors very successfully with very little preparation. Considering a typical garage floor, simply sweep up to remove excess dust and debris and you can start laying the tiles. They will successfully cover a coarsely tamped concrete floor and conform to undulations. You may need to chip off any high or sharp spots before laying. If there are step changes in the floor then the tiles should successfully lie over anything up to 10mm change. However, for anything over that, then you should consider cutting the tiles up to the step. Can the tiles be cut? The tiles can be cut with typical woodworking tools. Though a hand-held electric jig saw is the best option. The tiles are tolerant to being cut with any blade though a coarse wood-cutting blade works the best. It is normal to cut the tiles to within 5mm of any fixed point such as walls and pillars. Can I use car jacks and trolleys on the tiles? Yes. They are very dense and durable. Should a car be left on jacks for some days, then when the point loads are removed you may see shallow indentations. However these will recover to level over a few hours or days depending upon the ambient temperature. Can I lay the tiles myself? Yes, they are well within the scope of a DIY job and are easily laid with a little forethought and planning. However, we do offer an installation service if required. What is the optimum thickness? It depends upon the application. 5/6mm - lighter duty, foot traffic, office or gym. 7mm - the optimum for a residential garage, commercial garage or warehouse. 10mm - very heavy duty. HGV commercial garage or for anybody who requires the ultimate performance in terms of insulation and durability. Please note these are true thicknesses. 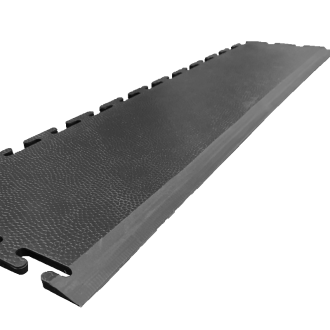 Many alternative products have a very deep grid pattern beneath that reduces their effective thickness and load-carrying capacity considerably. Do I need to bond the tiles to the floor? In most of cases, no bonding is required. Being manufactured of high density PVC, the tiles weigh around 9kg per square metre and happily lie flat under gravity. However, if your garage is south-facing, and you intend to leave the doors open on hot summer days, then the tiles will heat up and expand pushing against each other with a tendency to rise at the joints typically by 5-10mm. You should consider bonding the front rows of tiles in the areas where the sunlight will strike. We offer a suitable two-pack bonding material on our website. This type of expansion only occurs when they are heated by direct sunlight. Sunlight entering through windows generally doesn’t have the same effect. Do tyres mark the tiles? Rubber tyres tend to mark almost every type of floor including bare concrete, painted, epoxy and vinyl flooring. Tyre marks are far less obvious in the darker tile colours and is almost indistinguishable from the colour of our graphite and black tiles. If you wish to use the lighter coloured tiles to brighten up the garage or workshop design the floor in a layout that uses the darker coloured tiles where the vehicle will be parked. Tile the whole floor in graphite (a very stylish looking tile) or black. Use black, graphite or dark grey tiles where tyres will sit. Place strips of black, graphite or dark grey tiles where the tyres rest. The stain is a chemical reaction and will not damage the tiles or affect their durability. The stain is caused by a component used within the manufacture of car tyres called ‘6PPD’ (phenaline diamine). 6PPD is an anti-oxidant and is added to rubber products to resist environmental attack by ozone and Ultraviolet light. It also has other beneficial effects in the moulding of rubber itself. Since it adds to the cost of making tyres, manufacturers usually only add it to the softer high performance tyres. The staining is dark grey / green in appearance and will show within 4 to 5 hours of the tyre being located on the tile. The stain cannot be removed as it is a chemical reaction between the 6PPD and the surface it is in contact with. Where are your tiles manufactured? They are manufactured for us in the UK and despatched nationally using next day parcel or pallet delivery services depending upon the size of the order. Why should I go for the extra cost of virgin PVC tiles? Interlocking PVC tiles are intended to provide a long-term solution. So virgin PVC using uncontaminated raw materials offers the greatest stability from deformation and discolouring. It also offers the best surface appearance by far for a pleasing finish. If you cut recycled tiles you will find them to be made up of small particles of multiple plastics that don’t bond together too well. They also have a strong odour. At the end of the life of our tiles (20 years+), we can arrange for the tiles to be returned to the manufacturer to be recycled. Can I lay the tiles onto a heated garage floor? Yes, but the tiles need to be spread out in small piles with the floor turned on, and then laid whilst warm. Will water get beneath the tiles? Rain water may be pulled beneath the tiles if the bottom of the garage door isn’t sealed. This can be reduced by running a silicon bead or two beneath the full length of the front end of the tiles or ramps. If water runs off a car and forms a puddle, then a little may be pulled beneath the tiles by capillary action through the joints, but it will also evaporate through the same route. Any water beneath the tiles does not affect them, and virgin PVC has a natural biocidal characteristic that resists mould growth and unpleasant smells.